With smartphones at our fingertips, I think we're all guilty of hoarding hundreds and thousands of pictures without them ever making it to print. I decided to change that this Valentine's Day and surprised my husband with some beautiful pictures of some of our favorite memories. I chose Photography.com because of their AMAZING selection of printing types... they can print your images on everything from planked wood to glass to metal! I chose to print our pictures on Acrylic, which give a modern and sleek look with high definition printing that's lightweight and durable. I also LOVED that they arrived ready to hang (because my husband is not a handy man and I am... well you know... busy running the world lol). Photography.com offers printing in any size and after receiving my order in under 2 weeks - i think its' safe to say I'm hooked :) There's nothing that makes me happier than walking into my home and seeing beautiful memories on all of our walls. There's also an amazing deal going on right now... Buy 1 Get 3 FREE!!! Click here to take advantage of this awesome deal and order yours now and make sure to order them by Jan 29th to get them in time for Valentine's Day! The Acrylic finish is super glossy and vibrant! The pictures become statement pieces in your home! My fave holiday is just around the corner (and no it's not my fave because of the chocolate.... ok well maybe it's because of the chocolate), but this year I'm loving it so much more because of all the fun crafts I get to do with Zane! There is nothing sweeter than giving someone you love a DIY made by someone else you love! Below are my fave 5 DIY Baby and Toddler Valentine's Day Gift Ideas! I got this idea from The Crafty Crow who originally posted a tutorial for Mother's Day. I changed a few of the steps and decided to make a keychain instead of a necklace because I wasn't sure a bright pink heart necklace would match with my husband's suit every day at work LOL. Once cooled, insert your keychain ring and you're done! I found this idea on The Mommy Nichols. She's known for her awesome DIY projects and easy recipes... and this craft is no exception. With our little ones growing up so quickly, what better keepsake than a piece of art with their itty bitty tiny feet? I love how easy, quick and beautiful this canvas craft is! Click here to visit The Mommy Nichols website and get this craft started! Follow her on Instagram for more awesome craft ideas all year long! This is such an easy craft to do and your little one, no matter what their age, will have SO much fun doing it! You can choose whatever colours you want and the fact that it makes no mess is a bonus! It's a keepsake that you can hang anywhere in your home! Click here to see my blog post about it. I got this idea from I Heart Arts and Crafts. I think it's such a cute craft for older kids who know how to use scissors and can use glue. This is such a sweet idea and I love that your children will be able to do it all on their own. I recommend using washable paint or protecting your arts & craft area with plastic so that once they dip their fingers in paint you don't have the paint everywhere :) Click here to visit I Heart Arts and Crafts to see the full tutorial for this DIY. This last idea came from Inner Child Fun. This is definitely a craft for your older kids (unless you want to do it yourself lol). It requires very few things to buy and it's something that any Mom or Grandma will love. Your kids will have so much fun doing it and will love that their mom can use it every day! You can also do variations of this craft depending on who the gift is for - you can make a ring bowl, a candy bowl, decorative bowl for your home... the possibilities are endless! Click here to visit Inner Child Fun to make your own jewelry dish! Rambo has officially joined the list of men in my life who are picky eaters (lucky me), so I decided that instead of spending money buying treats that he hates, I would make him some delicious homemade cookies! It also gives me peace of mind knowing EXACTLY what's going in them... and the fact that he loved them didn't hurt either! I wish I could say that finding a great recipe was easy... but it wasn't. I had 3 failed attempts before finding 2 that he loved, but I guess good things don't always come easy! I hope your little fur baby enjoys them as much as Rambo did! I made him Crunchy Ginger Cookies and Mini Muffins! Scroll to the bottom for links to my fave cookie jars! On a lightly floured surface roll out dough until 1/4 inch thick and use cookie cutters of your choice to cut out treats. Put treats on baking sheet and bake 25 mins. Peel and cut carrot and apple and steam until soft. If using applesauce, only steam carrots. Fill greased muffin tin 1/2 way full with batter. Bake for 15 mins if making mini muffins, and 20-25 mins if making regular sized muffins, or until wooden tooth pick comes out clean. Here are some decorative that I think you'll love - perfect for treats, cookies, baking goods and storage! Click the links below OR visit my online store to see them all by clicking here. Chalk board labels - turn any jar into a chalkboard! My son is now eating solids and becoming more and more curious about textures and food tastes, so this mama has been trying to come up with creative ways to please his ever developing palate! It should come as no surprise to me (because I know who I married) that my son is a picky eater already like his father... forget vegetables and anything healthy... my son has a sweet tooth and a desire for anything savoury! I've been forced to become a bit creative in the kitchen to make sure he's getting enough vitamins and minerals from his food, so I was SO thankful when I discovered Baby Gourmet's Squoosh packs. They are snack sized organic fruit and veggie purées that taste DELICIOUS and each has a full serving of fruits and veggies! In case you're wondering, I have ABSOLUTELY tasted one before - if the food is good enough for my mini, it should be good enough for me! And in this case it definitely is! Zane's fave is the Squabbleberry Squoosh which has apple, blueberries, bananas and butternut squash, so I decided to try to make a more textured snack with his fave purée pouch and the result was a terrific muffin! 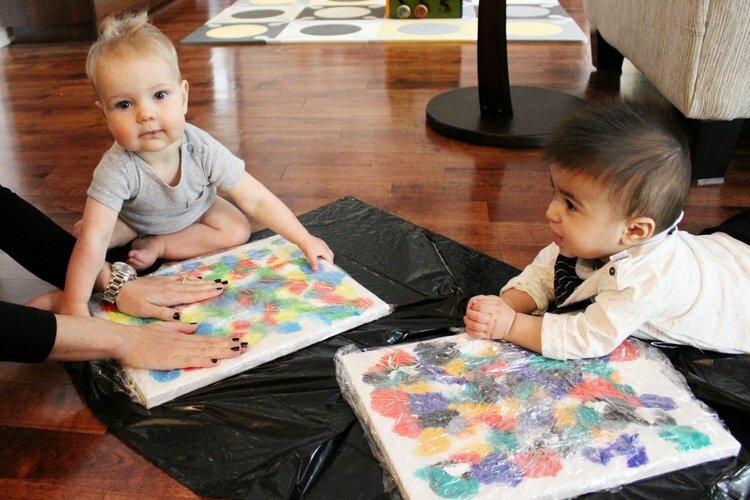 We had a blast last week making Zane's first piece of artwork with his bestie, Josh! It can be done with babies at any age (you might need to help the younger ones a bit), it's inexpensive and it's not something you'll eventually hide in a drawer! Step 1: Start by protecting your floors with the garbage bags! If you have a mobile little one, you may even want to tape the edges to your floor so that they can't move it around. Step 2: Randomly put your acrylic paint on your canvas. You can put it in any design and can put as much or as little as you want (the more you put, the less white you'll have showing through when the project is over!). You can also first mix the acrylic paint with water to give it a more blended look afterwards - but it may be a bit messier! Step 3: Cover your entire canvas with your plastic wrap! Make sure to have every edge covered in every direction so no paint can escape! Step 4: Put the cavas down and let your little one have fun! There's no wrong way to do this, and with the plastic covering, there will also be no mess! Step 5: Once your little one is done having fun, remove the plastic wrap and let your canvas dry! What you're left with is an abstract piece of art that you can hang anywhere in your home! Don't forget to sign and date the side so that you'll be able to remember how old they were when they made it :). I love this as a gift idea for the holidays! It's personalized, one of a kind and super special. Let me know if any of you try it! Black Friday Sales All Month Long at Canada's Baby Store! Listen up my Canadian mamas because I've got some insider information! Canada's Baby Store will be putting their top selling brands on sale everyday with prices that will rival and even beat those you've seen on Black Friday! EVERY DAY in the month of November, they will have a specific brand on sale for 1 day ONLY (so there's no coming back the next day to buy that brand.. you need to jump on it!). Most of the sales will be 50% OFF! I unfortunately don't know which brands are on sale which day, but you can either sign up to their newsletter by clicking here , or follow them on Instagram by clicking here to be notified of the sales! Let me know what goodies you all ordered and how you like them in the comments below! Going on a road trip alone with a 6 month old is basically suicide. There is nothing good that can come of it... yet here I am planning my second road trip with Zane. My first road trip to Toronto (which should have taken me about 5 hours and ended up taking closer to 7) involved 2 explosive car seat poops (one of which resulted in a bath for Zane in a bathroom sink at a gas station), projectile vomit all over my new car, and lots and lots of tears (from me not him). Why am I making this road trip to Toronto again you may ask? I have no idea... I guess I forgot how horrible the first time was and I want to try it again. Thankfully, my best friend will be waiting with some wine at the other end! 1 - Kleenex: Like I said above, NOTHING good comes of a solo road trip and you will end up ugly crying at some point... so Kleenex will come in handy (it's much more efficient than your sleeve which will probably have baby poop on it at some point). 2 - A change of clothes in the front seat: Obviously you'll have your suit case in the trunk, but in the event... or rather WHEN, your little one decides to have an explosive poop and kick and squirm so that it really gets into every groove of the car seat, you'll quickly pick him up and then have poop all over you. You'll need a change of clothes that are easy to get to so you don't get poop on your suitcase (yes this is a thing...and yes you need to throw out the suitcase after). 3 - More Kleenex: When you realize the poop smell won't come out of the car seat and you still have another 4 hours to drive, you'll cry more. 4 - A great play list: You'll need something upbeat - like Zumba music to give you the energy to continue on. At some point you'll debate turning around and going home or just pulling over not the side of the road and giving up... that's when you need to start blasting the Rocky soundtrack! 5 - A good sense of humour: No matter how prepared you are, your little one will throw you a curve ball because they're sneaky like that. 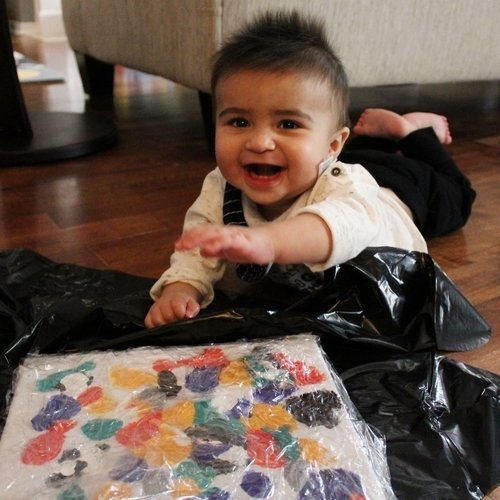 You can try covering your car seats with garbage bags to shield them from the throw up - your little one will find a way to pee on the car floor mat. You can try to bring 10 changes of clothes for them... they'll manage to get poop on them all. You can even try to plan your drive around their nap time - it'll be the one day they decide they hate sleeping. You need to laugh it off and take notes so that the next time you have the crazy idea of driving 5 hours with a baby, you remember why NOT to do it! *** In the event that your trip goes worse than mine did, I recommend bringing enough clothes to last a few months because you may decide to not make the trip back at all. Hopefully whoever you're visiting doesn't mind 2 new permanent house guests (hint hint to my bestie... we'll be staying a while). I am no stranger to failed picture hanging attempts... and I have holes in most of my walls as a daily reminder, so when I came across Flipside Prints I was intrigued! Not only do they offer me a way to hang prints in my son's nursery without damaging the walls, but I can also change up the prints by just flipping them over as he grows (It also didn't hurt that their prints are just adorable)! 1. I was able to hang them up while my son napped in the room without waking him up! : As a new mom I barely have time to breathe... so finding the time to decorate my son's room is nearly impossible because my little man always wants to be in my arms. I was able to hang up my Flipside Prints WHILE HE SLEPT because there are no nails and no banging on the walls! 2. No damage to my walls and no searching for tools: Flipside Prints use a sticky 3M film that literally took 2 seconds to put up, and it comes off just as easily. That means if I want to move the prints, move houses or remove the prints all together (I'm sure I'll never want to do that though), it's easy, hassle free and leaves NO mess on your wall. You also get EVERYTHING you need delivered with the prints! I hate buying something and getting home only to realize that I'm missing a screw or a nail. 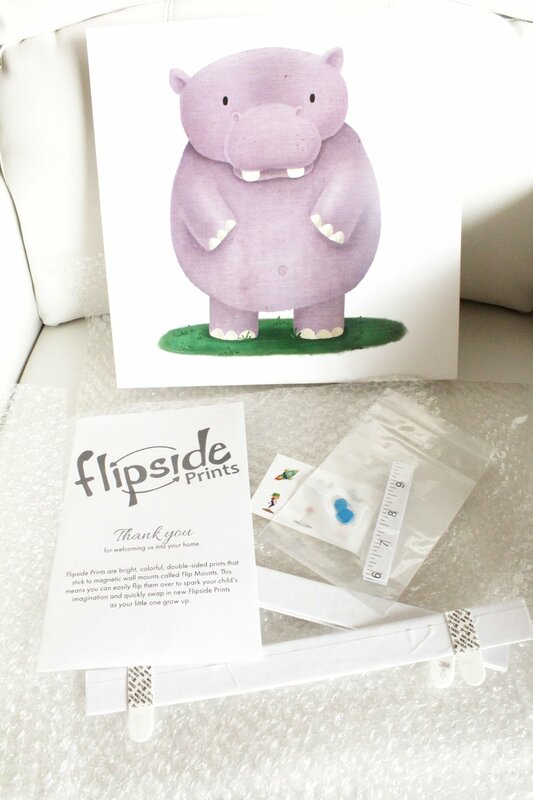 Flipside Prints sends you everything you need to measure and hang up their prints! 3. As your child's taste changes, so can the the prints: Flipside Prints do just as the name implies - they flip over! All the prints are double sided and because they use a magnet to hang, flipping them over is super easy to do! This means you can flip them weekly, daily, or even hourly! Ok but lets be real... no new mama has time to flip them hourly lol... but your little one may when they get old enough to do it! 4. The prints are super cute: I guarantee they will make your little one grin from ear to ear. Zane can't stop reaching for them, staring at them and laughing. We chose the In the Jungle theme prints, but they have everything from Under The Sea, to Tiny Dancer, to Mythical Unicorns! You are bound to find a theme that your little one will LOVE. I love things that are easy to use, don't take time to set up and make Zane smile. Flipside Prints do all of the above (and I love them too!). Check out their page and get your little one a set of their own! Use promo code: MNMM at checkout for 20% off your prints! Zane's Room - My First DIY Success! If you follow my Instagram stories, then you know I am not talented when it comes to DIY projects. Most of them just give my husband a reason to laugh or get upset... his reaction depends on how much money I wasted lol. My DIY failures extend to the kitchen (I can't cook and once gave myself salmonella poisoning), beauty (I once waxed off too much of my eyebrows and had a lopsided face for a month), and until recently included arts and crafts. I am SO proud to announce that for the FIRST TIME EVER, I had a DIY success! I had such a bad pregnancy that I never really got around to fully decorating Zane's room because it was uncomfortable to breathe, let alone start hanging things on my walls. So now that my munchkin is here, I decided to spruce up his room a bit! I bought some wood letters from Michael's Crafts and spray painted them a dark grey to match his room. (this part was a little bit of a failure because I almost sprayed myself in the face and put way too much on each letter so it took a few days to dry instead of 1 hour).... but the end result was great! I then ordered grey triangle wall decals from Indigo to put around the letters! I opted for decals instead of painting the wall because I figured if I messed it up (there was a 90% chance that would happen), then I could easily take them off before my husband got home to avoid being ridiculed. Scroll through the pics below to see the final product! Voila! A fully decorated wall for under $60! Zane, like most 4 month olds, is beginning to discover his hands and feet, and does so by giving me swift kicks to the stomach and ripping out my hair any chance he gets. It's a good day for me when I don't get my eye poked by his tiny little precious fingers (that have a way of finding my pupil EVERY time he pokes my eye). As a result, I am always looking for ways to tire him out because I really can't afford to lose any more hair postpartum and one of these days he will end up giving me a black eye with his little feisty fists. So when I heard about iFloat Baby Spa, where babies float around in a pool and can kick and move freely (and without injury to me), I was in! It was a bonus that they also gave baby massages, because you know he isn't spoiled enough already. Their website explains that the floatation and massage helps to improve socialization, strengthens bonding (because of the skin-to-skin contact), provides stimulation, promotes relaxation and better SLEEP, increases physical & cognitive development, boosts confidence & enhances well-being, improves coordination, and builds strength & develops learning skills. With all those benefits, how can you not try it at least once?... also please note the benefit SLEEP. Anything that will get me more sleep is worth a try. I'll be honest, at first I was a bit skeptical and nervous because at first glance, it looks like the floatation device is a bit uncomfortable... but I knew right away by Zane's reaction that it was anything but that. At first he didn't know what to do and kind of just floated around looking confused (sort of like me at the gym... out of place trying to figure things out), but 10 minutes in he was a natural (like me at McDonalds). He was yelling, kicking, laughing and splashing water everywhere. 30 mins of floating time was up and it was time for the baby massage. The masseuse is a registered massage therapist that specializes in baby massage. She gave him a head to toe massage using organic baby massage oil... and I think Zane's face says it all. We loved iFloat Baby Spa so much that we bought an unlimited ifloat and massage package for the month. In case you're wondering - he took a 2 hour nap after our first visit (YAY SLEEP!). And for those of you who are thinking it... I'll just say it first. My 4 month old son has a better life than most of us. Floating around and getting massages 4 times a week. Living in a condo or a small house with a new baby can be challenging if you don't do it right! It's really easy as a first time mom to get caught up in all the gimics and cool gadgets that flood our social media streams (I'm a sucker and buy everything). What is really necessary and what really helps save space? Here are my top 5 recommendations to make condo living with a baby a breeze. 1. Leave toys in boxes until baby is old enough to use them - and keep the boxes for later! It's so tempting when you receive gifts for baby to rip them open and assemble them in anticipation of using them. Baby is 2 months now and the toy says it's good for babies 3 months+ so assembling it now will save time right? Perhaps... but it will also leave your rooms feeling cluttered and make you feel like you're missing space. Boxes are more easily stacked and hidden under cribs, in closets and in storage rooms than assembled toys are. Babies also develop at different rates, so a 3 month+ toy may only interest your little one at 4 months or maybe even 5 months. Moreoever, by the time your little one is ready to use this new toy, you may be able to put another one away! We recently got a Jumperoo as a gift and when assembled, it will measure about 3 feet long x 3 feet wide and 3 feet high, whereas the box fits perfectly under baby's crib. I also recommend keeping the boxes for certain items so that you can easily store them when baby outgrows them. A couple great examples are your baby's infant car seat and vibrating chair. They are awkward shapes and will take up a lot of room in your storage unit or garage and may even get damaged unless you put them back in their box. Pottery Barn has some really cute bins! Baby bath tubs take up SO MUCH space and when you live in a condo and are struggling as it is to find somewhere to put everything, compact is essential. We found an amazing collapsible bathtub by Boon called the NAKED bathtub that is great for infants and toddlers. It has two positions (incline and regular) that make it easy to use for parents and safe for baby. It also has a hanger built in so it can drip dry from your shower when you're done using it! I've included some pictures of it below! Another alternative is to give baby a bath in your sink, however depending on how big your baby is and how big your sink is, this isn't always an option. It's a totally normal feeling to be so excited for the arrival of your new baby and to want to be overly prepared - especially when the nesting urge kicks in. But when living in a smaller space, I don't recommend stocking up on things that baby won't need for the first new months. Just as I recommended leaving toys in boxes until they will be used, I recommend buying items as you need them because other items will be able to be put away. An example in my life is Zane's rocking/swinging chair and a Play Yard. Both, I believe both are necessary and super helpful, however at Zane's age now, he uses the MamaRoo on a daily basis whereas he's too little to use a Play Yard - he can't move anywhere yet so I don't need to keep him confined. Instead of having both set up in my living room (which would take up a lot of room), once he outgrows the MamaRoo, I'll go and buy a Play Yard and put it where the MamaRoo currently is! If you enjoyed this blog post, follow me! I always promised myself that I would never be one of those moms or pregnant women that let themselves go. I promised that the day I decided to start trying to have a baby, I would be in the best shape of my life, eating healthy and working out on a regular basis. Well... surprise surprise, life doesn't always happen the way you plan. I was very fortunate and got pregnant after 1 month of trying and had horrible nausea that was only controlled and helped by super greasy food for the first 4 months of my pregnancy. I had ridiculous and out of control swelling due to borderline pre-eclampsia which caused me to start gaining about 2 pounds a week by month 5. Last but not least, the baby started pushing on my sciatic nerve by month 7 which completely immobilized me and left me basically bed ridden for the remaining 3 months of pregnancy. By the time baby Zane came into the world, I had conservatively put on 95 lbs. Granted, a lot of it was water weight... so the first 45 lbs came off really quickly (within the first 2-3 weeks of delivery), that last 50 lbs was not so nice. I am now 3 months pp (postpartum) and I have not lost a SINGLE pound since the initial 45 lbs loss. My hubby and I have our anniversary on August 7th and he decided to be super romantic and suggested that we go back to Delray Beach, FL, where we got married to celebrate. Super cute idea right? Except that I am NO WHERE near feeling comfortable enough to strut my stuff in a bathing suit. I look at my body and all I see is cellulite, loose skin from the weight that I have lost, and fat (On a side note - who knew that you could get cellulite on your back?! like really?). I know I'm being a bit dramatic, but I think we've all felt a bit discouraged at some point after pregnancy about our bodies. I've decided that instead of feeling bad for myself, I am going to do something about this situation starting TODAY. I have a tendency to procrastinate (don't we all?) and this is how I am now 3 months pp and no closer to being at my pre-pregnancy weight. I am going to take my measurements tonight and take some pictures so I have a starting point to look back on when I feel discouraged or feel like taking a bite of a donut (or when I feel like eating a whole box of donuts... lets be real). ** Note: I don't generally believe in extremes and I don't think that cutting out all the foods I love the most (hamburgers, ice cream, donuts etc.) is a long term solution - however my goal is to be in better shape in 2 months so a big change needs to be made. I believe that in order to maintain a healthy body and lifestyle, moderation is key so that you don't end up binge eating or giving up.